There must have been something in the water last Fashion Week, because this season, all of our favorite street style stars are pregnant. Well, at least a handful of them. And they look good. Russian pals (and expectant mothers) Miroslava Duma and Natasha Goldenberg look perfect on a daily basis (because when you&apos;re wearing Burberry and Hermes straight off of the runway, it&apos;s difficult not to), and still perform the requisite between-show outfit changes that we&apos;ve come to expect from them. And they&apos;re still wearing heels! Eva Chen, who announced her pregnancy on Instagram in the most adorable, Eva Chen-esque way possible, has been proudly showing off her belly in fitted dresses and high-waisted skirts. Finally, Yasmin Sewell has favored more slouchy silhouettes and flowy dresses this week, but she hasn&apos;t shied away from sharing the occasional belly bump photo over social media. 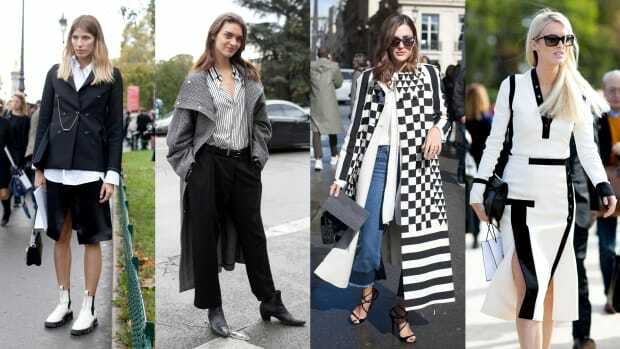 So if you were wondering who the next generation of street style stars will be, we should all be finding out in just a few months. Update: It looks like one more street style mainstay has a bun in the oven: Taylor Tomasi Hill. Congrats to the stylish momma-to-be! As usual, we've saved the best for last--even though Paris is at the end of the packed fashion month schedule, it never falls short on style. There's just something about the City of Lights that inspires people to pull out their most amazing bags, shoes, and clothes. Plus, more of our favorite looks from the penultimate day of Fashion Month.